With the systematic breakdown of the family and the barrage of bad news we receive on a daily basis, it is no wonder that about 21.5 million people or about 9.5 percent of the adult population in the United States is diagnosed with having a depressive disorder. Turn on the news, open Facebook, or just listen to the radio on the way to work, and you will probably feel down in the dumps. The book of Job has some insights into depression that can help us as we wade through the pit of depression together. Job’s story is famous. Job’s depression was circumstantial, not biological. The Bible, in Job chapter 1, says he was upright, blameless, deeply revered God, and turned away from evil (1:1). Regardless of his upright living, he lost his livestock (1:16), his children died (1:19), and if that wasn’t enough, he contacted painful boils (2:7). 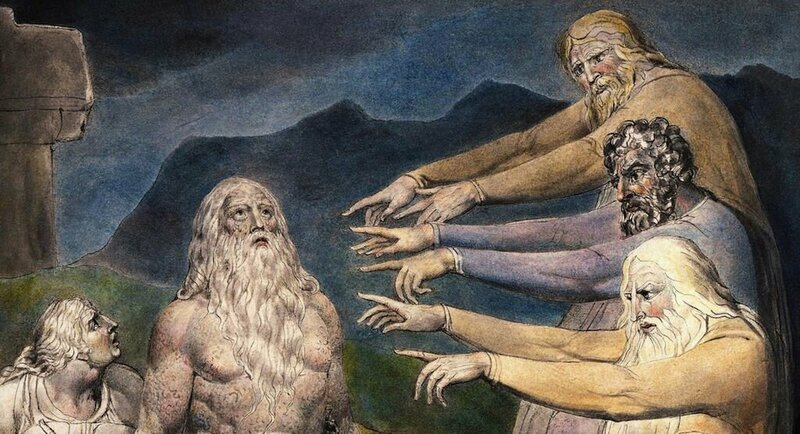 Even through all this, Job never blamed God (1:22). This is how life is some times. It rains on everyone–even those that live rightly. The difference is in how we react to suffering. Let’s examine this a bit more. Job is written in a chiastic structure. This is literature device emphasize a certain point. Imagine a sandwich—there are 2 pieces of bread and a piece of meat in the middle. The meat is what we really care about, right? Like a sandwich of emphasis, the Book of Job begins with his suffering (1-2) and ends with his restoration (42:7-17). But that is the bread of the sandwich. The meat of the sandwich is Job’s complaint (29-31). Understandably, Job was depressed. He shows several signs and symptoms. He suffered (3:20, 6:2-3). He desired death (3:21). He had sleep disturbances (7:14). He was pessimistic about life (14:1). He felt helpless (3:26), worthless (9:11), and full of despair (6:11, 7:7, 17:1,15). He was under physical distress (16:8, 17:7). He lost his appetite (6:6-7). He was physically weak (6:12-13). He feared further suffering (9:28, 10:19, 17:6). He was angry (7:17-19) and bitter (10:1). He felt a sense of rejection (19:13-20). * It is important to note that in feeling all of these emotions, Job wasn’t turning his back on God. It is ok to authentically feel. God created these emotions. Don’t hide from them. He was close to God even in his anger and bitterness. Job, however, didn’t stay swimming in his misery. He chose to not waste his suffering. Job 23:10 says, “He knows every step that I take; when He has tested me, I will come forth as gold.” Job is clear that God allowed the suffering. He even called it a test. Before I had kids, I found it difficult to imagine a loving God doing this. Now that I am knee deep in raising 3 of them, I can see that if I swooped in to rescue them every time they hurt or struggled, they would never learn. Benjamin Franklin talked about pain. He advised, “That which hurts, also instructs.” God did not cause the suffering; He allowed for it. He is all wise (29:23) and all perceiving (29:24) and knew that the end result would be much soul-making for Job. So, what can we take away from this? Life stinks and just hang on until Heaven? I say no. Life is full of suffering, even suffering to the blameless (2:3). However, when we choose to not waste that suffering, what Satan intended for evil, can be for God’s glory! When we cling to God and shun evil (28:29), be patient, persevere, and allow the suffering to refine us, God can use it to grow us and glorify Him. There is a little girl who has spent much of her life battling a rare disease. Often the cure for the disease had made her more sick than the disease did. She has spent more days of her 4 years of life in the hospital than at her home. At 4 years old, she has only been healthy enough to get on a park swing twice. After a recent hospital stay of more than a year, her mother described her desire to not waste their family’s suffering. She wanted to share the lessons God has taught her and use them to encourage others, to build them up, and bring glory to God. Like Job, she has suffered greatly, and like Job, she chooses to cling to God. So today, as the swells of life begin to overtake you, allow yourself to feel the authentic emotions that God created, but don’t drown in them. Use the trials to come out come out as gold. *This article is not intended to be clinical in nature. Instead, it is indeed to be pastoral. Two good resources concerning this topic are Perry and Sell, Speaking To Life’s Problems, 1983 and Neville Kirkwood, Pastoral Care in Hospitals, 2005.